While thumbing through a copy of the Free Times today at work I came across this article. Near the bottom of the article Creepy Cleveland was mentioned. I got sad. 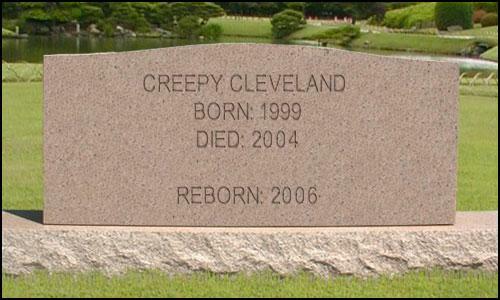 I really, really loved running Creepy Cleveland a few years back and have decided to take the reins again. Besides a place for the page to live, the biggest problem I had back when Creepy Cleveland was in it's heyday was keeping it updated. I've got some ideas to remedy that problem. In only the few years since I was actively running Creepy Cleveland the web has exploded with new services. I'm going to take advantage of some free advances in web technology to make it easier for everyone to find information they want and contribute (because - let's face it, the stories were probably the best part of old Creepy Cleveland). There's gonna be a bunch of changes. I have a ton of back email to wade through. I've got a hundred links to validate and repost. There are many people I have to get back in touch with. But, God, it's gonna be fun.